Like many Itasca area teens, Jane Levens had a vision for her future. Go to school. Get a job. Get a life. The Grand Rapids High School senior’s vision was brought within reach when she was awarded a Blandin Foundation scholarship in 1971. Her vision, and the funds, propelled her to a nursing career that spanned more than four decades. I was born and raised in Grand Rapids until fourth grade when we moved to Swan River. I attended Grand Rapids High School, graduating in 1971. I was the oldest of three children. My dad worked in the mines. Once we were older, Mom worked with the county giving care to people in their homes. There was no money for college. I do not remember how I heard about the Blandin Foundation scholarship, but it was perfect for me because it was a financial need scholarship. I remember we had a banquet to celebrate and there were so many of us there!! This scholarship paid in full all three years of my education at St. Luke’s Hospital School of Nursing [in Duluth], including uniforms, books, room and board. 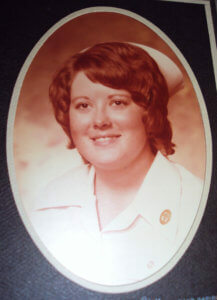 In 1974 I graduated with my Diploma of Nursing, RN. After graduation I moved to Greenville, SC with a classmate. This was such a fun time. We were close to the Blue Ridge Mountains and to the ocean, so did a lot of exploring. We took drives to Georgia and Florida. Learning about the southern lifestyle and foods was very educational. I loved going home with workmates to meet their families, and take part in their traditions. I then moved to Charlotte, NC, where I worked in the orthopedics department at a specialty hospital for the majority of my career. I still have many treasured friends who live there. From there I went to Lexington, SC, and then to Quincy, IL where I now live. I worked in hospitals for 37 years and a nursing home for four. Being a nurse is an amazing career. The education applies every single day of your life. Not just in maintaining our own health, but being able to help family and friends. We can interpret [complicated medical] information in way that individuals can understand. We take care of elderly parents. We cannot diagnose [illnesses or conditions], but we sure can advise people to go see a doctor! My Blandin Foundation scholarship made my career possible. Without your help, I would have not been able to attend any further education. You gave me the means to support myself, and to have a career that I have always been proud of. I cannot thank you enough. Your program is truly a blessing, and I am thrilled to see it continues. You DO make a difference in lives!! You make dreams come true. May God bless each and every person involved with the scholarships.